The Spanish name is due the fact that the industrial activity was started by Carl Ingenohl in the Philippines where the group owned plantations and a factory. 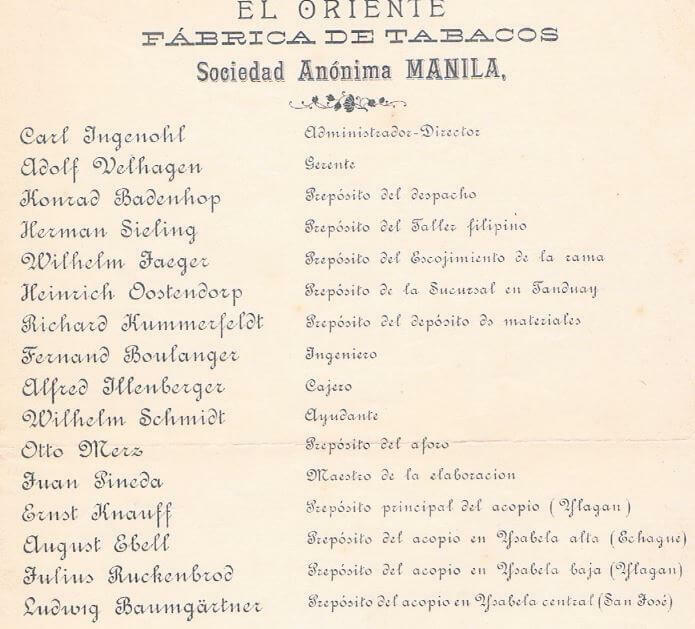 The document below, both translated and original, reflect the management structure of the El Oriente Cigar Company in Manila in 1904. This was a few years before the Hong Kong factory was built. HF: We have several articles about the company’s operations in Hong Kong and about Carl Ingenohl. All are shown, linked, below. Convey their warmest thanks for the many expressions of sympathy on the occasion of the flooding incident which the company suffered on 13 July. Santa Cruz de Manila, Quiapo de Manila, Tanduay de Manila, Ylagan (Ysabella), Echague Ysabella, San José Ysabella. 1 October, 1904. Thank you for this article. I am a descendant of Adolf Velhagen and I’m doing research on the company. Might it be worthwhile doing research in the HK archives?